With Syria making national headlines on a daily basis, it’s easy to forget about the Middle East’s other proxy war raging in Yemen. For months, a Saudi-led coalition has been battling Iran-backed militants for control of the country which was effectively wrested from Mansour Hadi earlier this year when the Sauid-backed President was forced to flee to Riyadh as the Houthis advanced on Aden. Sadly, Yemen has since descended into chaos, an embarrassment for the Obama administration which just a little over a year ago held the country up as an example of Washington’s successful counterterrorism efforts (no mention was made of the alleged covert cooperation between the government of Hadi’s predecessor Ali Abdullah Saleh and AQAP). Between the Saudis, the UAE, and Qatar, the coalition has managed to push the Houthis back, but the human and cultural toll has been high. Riyadh and the Houthis routinely play headline hockey in an effort to play up or play down the number of civilian casualties that result from Saudi bombing runs and Sana’a, a UNESCO world heritage site, is gradually being decimated as coalition forces fight to take back the city. Last Thursday, a shoe bomber and an accomplice detonated themselves in a Shia mosque where the Houthis go to pray. The attack was claimed by Islamic State which is of course notable because this is the very same Islamic State that is fighting to destabilize Bashar al-Assad who, like the Houthis, is backed by Tehran. Iran-backed Shiite militias are also fighting ISIS in Iraq, an effort which is now set to benefit from cooperation with the Russian and Syrian armies. The takeaway here is that Yemen, like Syria and Iraq, is a theatre for the regional and global proxy wars that have pitted the US, Saudi Arabia, Qatar, and to a lesser extent Washington’s European allies against a “nexus” comprised of Russia, Iran, Syria, and China with the latter having thus far only asserted itself via its Security Council veto. What’s particularly interesting about this is the extent to which the traditional Western conception of who the “good guys” are and who the “bad guys” are has been turned on its head of late. That is, Russia’s willingness to confront ISIS in a straightforward way (as opposed to through the use of various proxy armies who in many cases end up defecting and becoming extremists themselves) as well as the realization that the man once billed as the world’s number one state sponsor of terror, Qasem Soleimani, is seemingly far more interested in preserving the Mid-East BOP by using Iran’s Quds Force to combat Sunni extremism in Syria and Iraq than he is in facilitating attacks on the US and its allies, have left the world to question whether it is in fact the West that’s been the proximate cause of the turmoil in the region. A Saudi Arabia-led military coalition that has been fighting Iran-supported rebels in Yemen said Wednesday that it had stopped an Iranian boat carrying arms to the war-torn country. The boat carried 14 Iranians and was laden with missile launchers and anti-tank weapons, the coalition said in a statement, including firing guiding systems. It was seized around 1pm local time Saturday, Sept. 26 in the Arabian Sea, about 150 miles southeast of the Omani port of Salalah. Oman shares a border with Yemen. The coalition said the boat is registered under the name Jan Mohammed Hut, an Iranian citizen. The vessel had a license from Iranian authorities to fish in those waters, the coalition said. Saudi Arabia has been fighting Iran-supported Shiite Houthi rebels in Yemen since March, in a bid to restore exiled President AbedRabbo Mansour Hadi to power. Politically Iran supports the Houthis, but denies supplying them with weapons. There was no immediate response on Wednesday from Iran. Saturday’s incident is the latest seizure of boats allegedly carrying Iranian arms bound for Yemen. The U.S. Navy and Yemeni coast guard detained a vessel called the Jihan as it sailed from Iran into Yemeni territorial waters in 2013, according to a United Nations report. 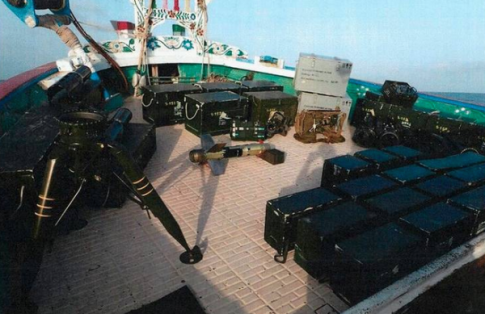 The boat was loaded with rockets, plastic explosives and other munitions a U.N. panel traced back to Iran. It was unclear whether the arms were bound for Yemen or for the Houthis, although the ship’s crew was Yemeni and the shipment was arranged by a Yemeni businessman, the U.N. panel said. The reason this is important is that it helps to provide context for the various conflicts unfolding throughout the Middle East. The key thing to understand here is that the fighting in Yemen, Syria, and Iraq is all related and it all comes back to the existing balance of power as delineated above. Russia’s official arrival on the scene in Syria means that Moscow is now prepared to defend this balance of power overtly, marking a step up from the dynamic that existed previously wherein, as exemplified by the story excerpted above, the powers that oppose the West were content with the “covert” support they could provide to their various proxy armies.